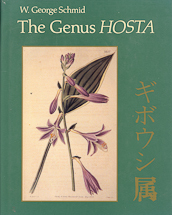 In 1991, W. George Schmid published his landmark book, The Genus Hosta which made a number of changes in the way hostas are categorized. Before that time, there had been quite a bit of confusion and disagreement on the taxonomy of the genus. Through this detailed tome, Schmid helped to organize the taxonomy of the genus in several ways. One of the most significant changes was shifting some plants from the status of species into cultivars. In most cases, the determining factor was that plants such as Hosta fortunei or Hosta tokudama could not be shown to have ever existed in the wilds of Japan, Korea or China. His determination was that they were either selections or hybrids from gardens or nurseries. Therefore, these and several others were reclassified as cultivars whose names should be H. 'Fortunei' and H. 'Tokudama'.